The walls are pine, and it is actually the same product on the exterior installed the other way around. My daughter thought this look is more refined and finished. 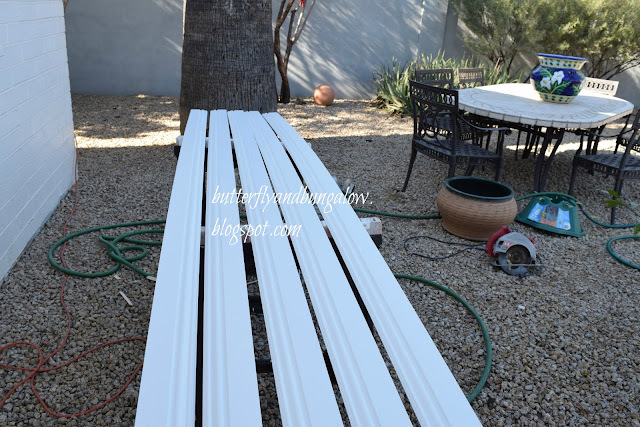 She placed her paint chips on the tile floor, and from several samples of white she chose something simple and clean for the walls: SW "Designer White". With all the windows it will keep it cooler in the heat, plus she wanted a year round beach or winter look, which makes her feel cooler temperature wise. Actually, we used the same wood product in my spouse's office a year ago, but stained his with SW Black Fox by giving it one light coat. What about the ceilings? She chose to leave them natural. 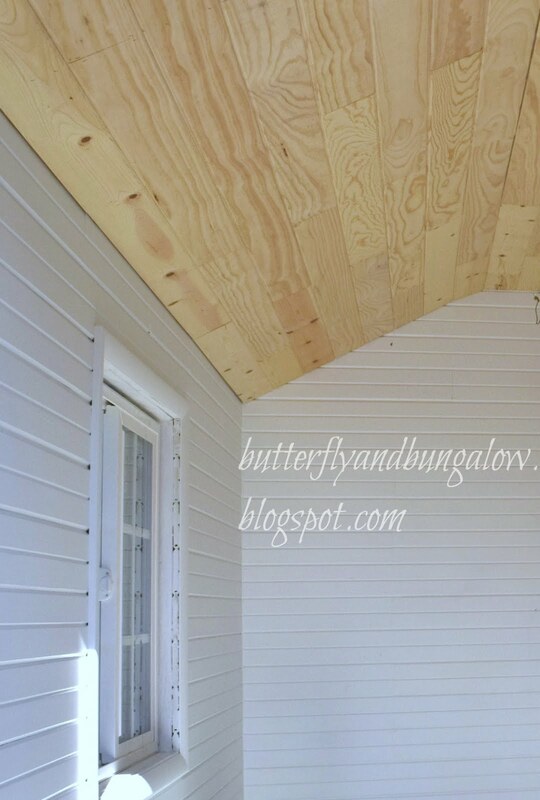 Again, it is the same product that is on the shed's exterior and interior but installing the wide side on the ceiling. 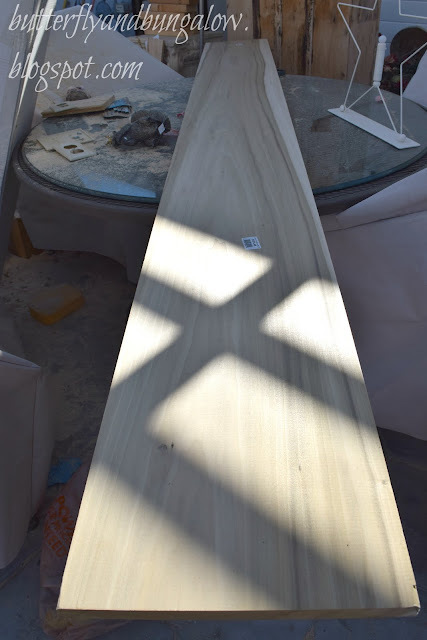 She loves the look of my spouse's beamed ceiling in his office, but that is original and dark, and she also loves the wood on the ceiling in her Italian Alps inspiration room, so she is really happy with the contrast. It also looks nice with the floors, but they are covered with plastic in this set of photos. It was a lot of tricky cuts for my spouse, because the interior is peaked and actually barn like in regards to the angles. We really love the look too. 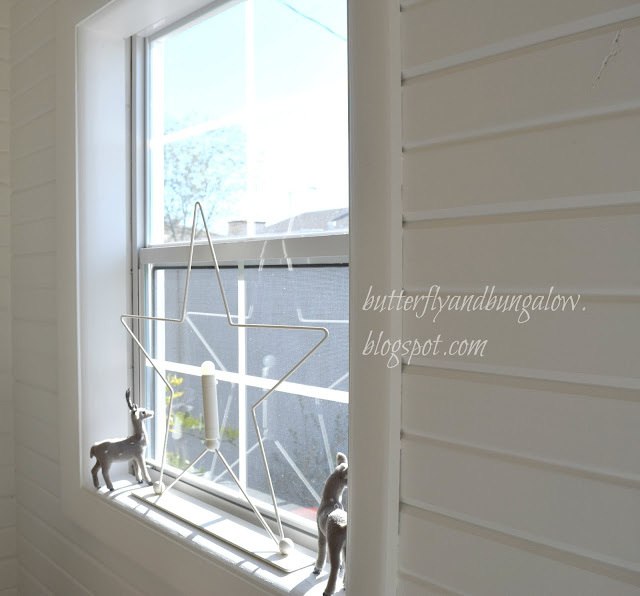 This window is finished being trimmed on the inside, and the windowsill looks really pretty. She loves windowsills, and they don't always have them in Arizona. My daughter placed the star and deer in the window for winter. In this photo the baseboard is getting paint. And over here, a couple of shelves are being constructed for books and display. One shelf is going on the long wall, and one is going over the smaller window. This is birch wood. It is straighter than pine. Some people like to see the process of a project and some like to see the end. If you missed the series beginning, here are the earlier posts, but we are getting closer to being done. Thank you for visiting and following along. I'm enjoying the updates, but I can't wait to see the final reveal. I am liking your daughter's choices and enjoying watching things progress. I love her star and deer on the sill ! This is fun to watch, thank you for taking us along the journey! No windowsills here, so it's nice to incorporate one in your daughters Alpine cottage. Looking so good Su. I know this is going to be adorable when you get it finished. I cannot wait. This is so neat! Your daughter is a lucky girl! How exciting for all of you! Oh Su, it is beautiful and it seems to be coming together quite quickly. In my part of the country the product that you used for the exterior siding and interior walls is referred to as car siding and i have really only seen it used like your interior with the grooves showing but the reverse is gorgeous as well. Painting the interior white will really bounce the natural light around inside. Great choices. Love the updates and can hardly wait to see the final results. I know the room will look terrific. O, this looks like such fun. I'm way behind on visiting...I need to go back and read the other stages. I'm just catching up with this project. 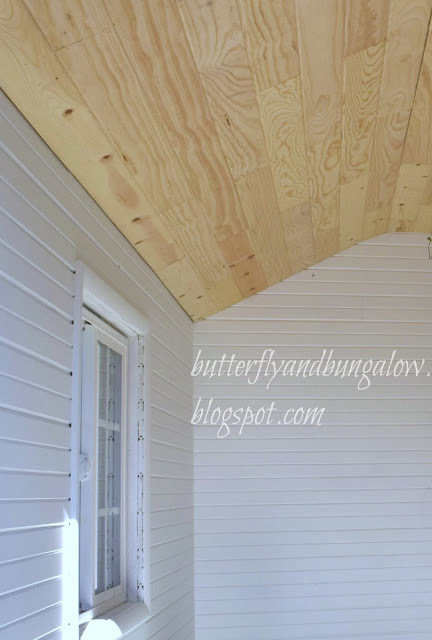 It's good that the boards look interesting whether inside or outside. I had no idea that there were different shades of white to choose from! Using a paint product that you know goes on well makes life easier. Everything is coming together well. Your daughter has very good taste. The idea to paint in a beautiful white the walls to keep the room cool is great. I'm growing enthusiastic more and more about the development of this project of yours, sweetest Su, you're truly working hard ! I am so proud of your daughter. A fun, fun project. Great progress! The ceiling looks awesome. Can't wait to see more! Such a fun project. I keep thinking what a wonderful memory this is for your daughter. Seeing her father bring her dream to life. Heartwarming.